Every year, Google releases Zeitgeist, their roundup of user search behavior from January through November - data culled from billions of searches. Of course, you're bound to see terms like "sarah palin" and "obama," but dig a little deeper and you can find some opportunities. And just because 2008 is coming to a close, that doesn't mean users are going to stop searching these terms. But to keep up-to-date on any of the terms discussed below, check out Google Trends. The headliner of 2008 Zeitgeist is "layaway," directly reflecting the economic climate. Take a look at the chart to the right - 2007 is in blue, 2008 is in red. It's not hard to see that consumers are interested in deferred payments. As such, you should make sure you have some of those options available. Check out eLayaway.com. Of course, "financial crisis," "depression," "bailout" and "mortgage crisis" were all popular search terms this year. There are some interesting results here, and a few key takeaways. Take a look at the list to the left. Obama is a given, but Facebook, coming in at #2 should get your attention. This is where consumers are and they will continue to flock. The latest data from Compete.com shows that Facebook is trending to see more than 50 million unique visitors by the end of the year. Looking at data from Quantcast, 62% of site visits are from "addicts," 34% are from "regulars" and a miniscule 4% are from "passers-by." That means a whopping 96% of visitors to Facebook spend considerable time on the site - your brand needs to be there. Positions 3 and 4 should tell you that mobile is emerging as a dominant platform. And if there's one thing that's hot on mobile, it's apps. Consider publishing an app for your brand, but don't limit just to iPhone. Google's Android will start to make serious headway this coming year, thanks to the Open Handset Alliance. "Solar panel," "hybrid car" and "cfl" (compact flourescent lamp/lights) were all popular search terms in 2008, due to the green movement picking up steam. But have a look at the DIY list to the left. There are plenty of categories here that touch a variety of industries. "DIY wedding" comes in at #1 and could entail everything from paper invitations to flowers and video equipment. Plenty of opportunity for an opportunistic Web professional. 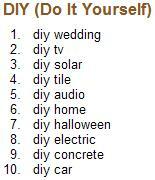 Perhaps the farthest-reaching category is #6, "diy home." You can only imagine the possibilities with this one. So, depending on your industry, consider writing, optimizing, and marketing some blog posts that relate with some of these popular DIY searches. Better yet, make a DIY video and put it on YouTube - #5 on the Fastest Rising Searches. There are many more categories from Zeitgeist that may have an impact on your business and inspire you to branch out. Even if you don't find something is an exact match for your business, think outside the box. There may be some connections that are not immediately apparent, or even some affiliate opportunities. This falls under the "just because" category. It's the holidays and we should all be thinking about what we can do as individuals and organizations to help make the world a better place - for our friends, families, neighbors, children, colleagues and even people you may never know or see in your entire life, across all borders. I find positions 3, 4 and 5 on the list to the right - fastest rising searches through Google Translate - both fascinating and refreshing. Have a safe and pleasant remainder of the year and best wishes heading into 2009.